© Review by : Stuart Smith, photos: Brian (Percy) Drummond & Stuart Smith. The walk consisted of three separate sections, each of which could be taken as individual itineraries, but we planned to make the most of the excellent early winter weather and attempt all three in one go. The day dawned with a thick fog, although by the time we had reached Dorset, blue sky was everywhere to be seen, and hardly a breath of wind either. Arriving at Weymouth via the 07:35 from London Waterloo, we easily found the Quay branch outside the main terminus station. 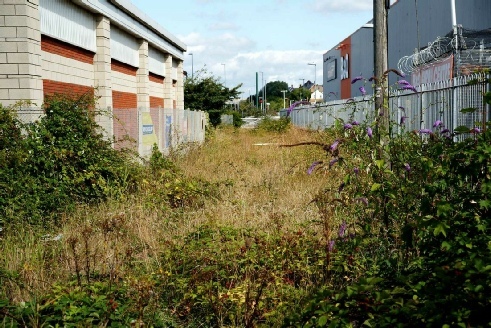 The overgrown trackbed (located behind the B&Q superstore) is still walkable virtually almost up to the junction with the Network Rail infrastructure. This part of the line is heavily overgrown with weeds, but the tracks are there if you stumble through it enough. A colour light signal still stands today (which remains lit), although the last train* to operate over the branch was a railtour in May 1999! The overgrown track-bed of the former Quay Branch close to the Network Rail Boundary. (Note the red signal protecting the former Weymouth Jct). 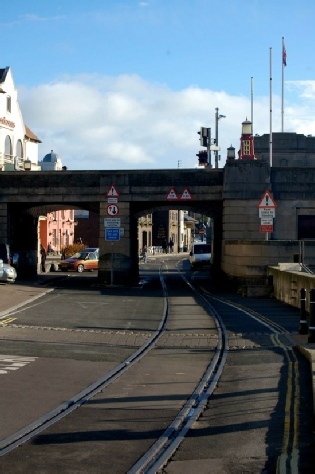 We followed the rails as far as Town Bridge, beyond which they continued the short distance to the end of the line at Weymouth Quay station. Walking away from the station, the line runs down the centre of the road as it skirts the modern quayside, which was crammed full of sailing vessels and fishing boats. It was noticeable that in places the main road has fairly recently been resurfaced, yet the rails themselves have not been covered over - thus allowing an easy return to use should the need ever arise in the future! Looking towards the Quay station, the tracks of the disused branch pass under Town Bridge. From here we doubled back to the main station, and headed a short way beyond it to Abbotsbury Road, and the start of the Rodwell Trail along the former Weymouth & Portland Railway. 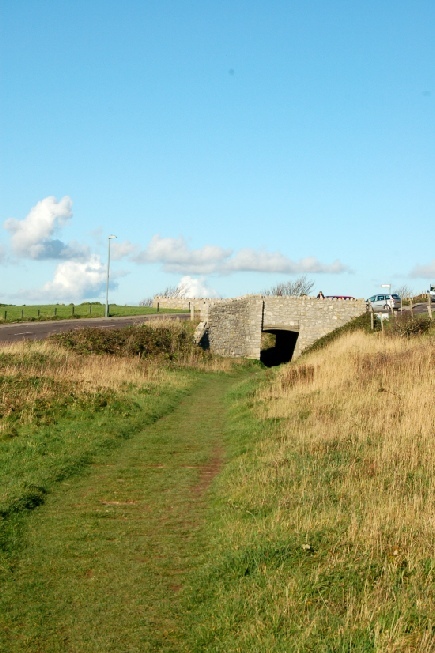 An information board at the start of the trackbed gives a brief history of the line - The line was constructed in 1865 to carry passengers and stone between Weymouth and Portland. It closed to passengers on 2nd March 1952 and to freight traffic on 5th April 1965. The platforms at Westham Halt still survive, and like others on the route, has had a Southern Region green 'totem' style sign erected to identify them. The former track-bed has been turned into a cycleway and footpath, and apart from the removal of one bridge over Newstead Road; it is completely intact from here to Ferrybridge. not been covered over - thus allowing an easy return to use should the need ever arise in the future! 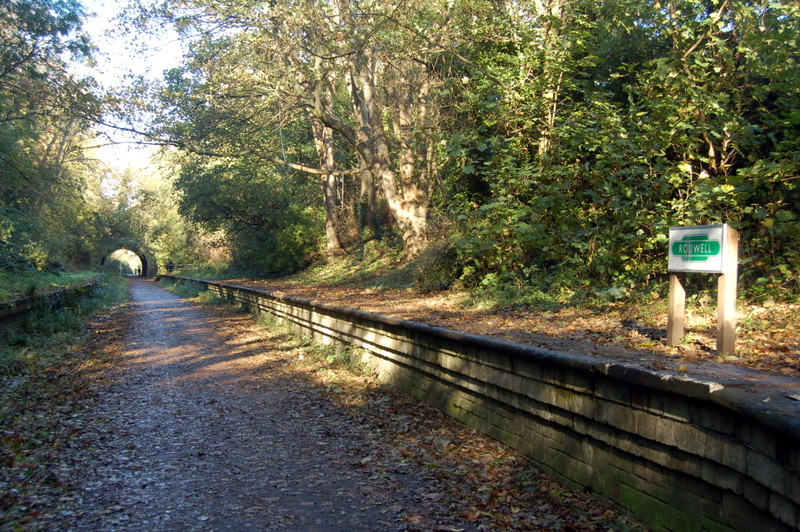 The abandoned platforms of Westham Halt mark the start of the Rodwell Trail. 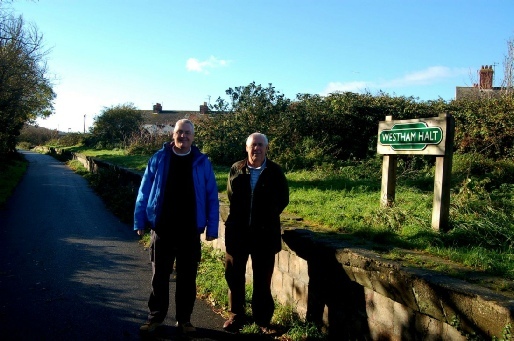 L&CI Members, Martin Hilton & Alan Hughes, prepare themselves for the interesting walk ahead. The bridge over the Newstead Road has been removed, although the grassy embankments still remain to mark the course of the former line. The double track Buxton Road tunnel just north of Rodwell station.L&CI Members, Martin Hilton & Alan Hughes, prepare themselves for the interesting walk ahead. 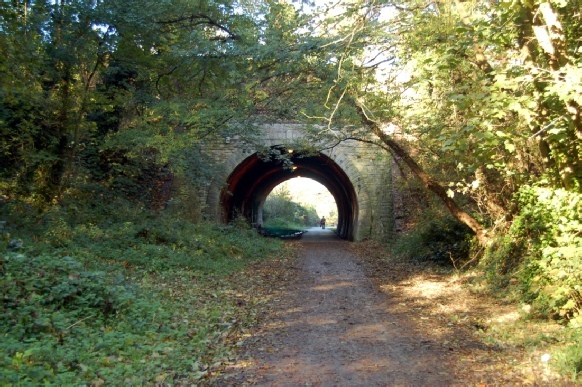 The double track Buxton Road Tunnel remains, as does the incredibly small halt that once served Sandsfoot Castle - one that we would probably have missed if it were not for the sign erected by the "Friends of Rodwell Trail", that exist to actively promote the route. easy return to use should the need ever arise in the future! A short way further, and we passed the remains of Wyke Regis Halt and then the site of the former Whiteheads Torpedo Factory, although very little evidence of the latter exists. After this, the line leaves the cutting gently rises up to run along the edge of Portland Harbour, with superb views across to Portland itself. The second 'gap' is just after Ferrybridge, (where the track once crossed Fleet Lagoon), which today necessitates a slight inland diversion for a few hundred metres around a small man-made sandy beach. No obvious sign of the former bridge exists, although its course is clear from the embankments either side of the water. 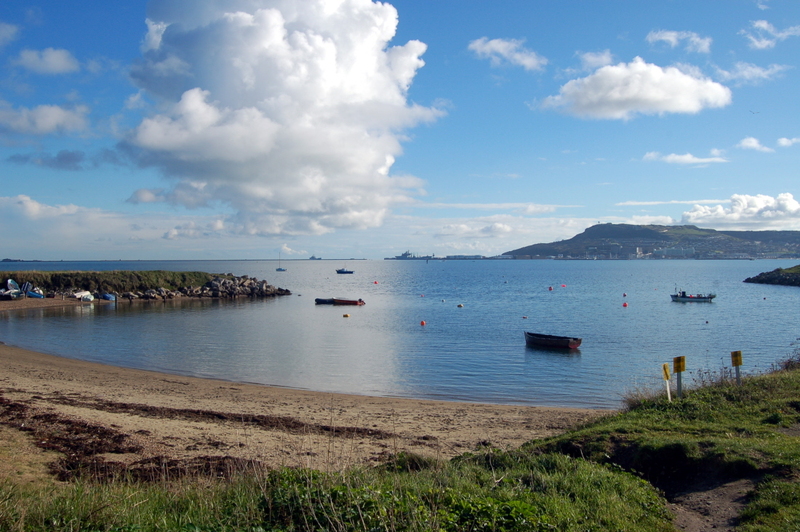 A man-made beach is now located close to Fleet Lagoon. The bridge that carried the tracks across the water at this point has long since been demolished. Coming now alongside the main road into Portland, we were walking along the spectacular Chesil Beach, and past the location of some sidings that went down to the waters edge. A slight inland diversion for a few hundred metres around a small man-made sandy beach. No obvious sign of the former bridge exists, although its course is clear from the embankments either side of the water. 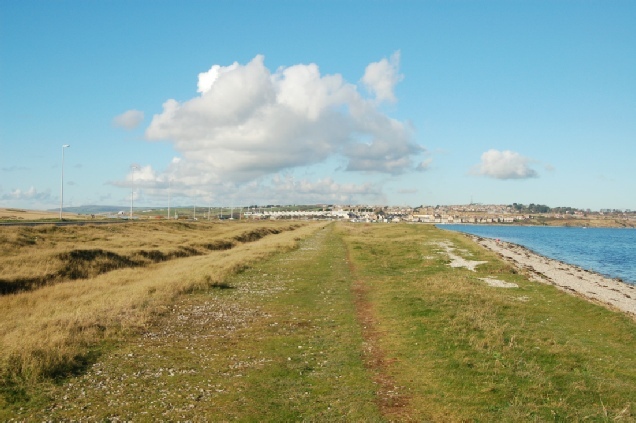 The course of the track-bed is clearly visible as it crosses the causeway close to Chesil Beach. To the right of the picture is where sidings once diverged down to the waterside.been demolished. A short way beyond this we entered the Isle of Portland (Victoria Square) and attempted to follow where the vast array of railway lines had once served the docks and piers. However, virtually all trace of them has long since been wiped away by the new modern marina and quayside developments (Osprey Quay), which have, been built for the expected influx to the area prior to the 2012 Olympic Games. Passing Portland Castle (surely one of the smallest castles I've ever seen) marked the conclusion of the second section of the walk, and for those who might wish to only walk up to this point, before returning to Weymouth, this would be an ideal point in which to catch the bus from nearby Fortuneswell. Up to now, the route had been virtually flat, with little noticeable undulation. However that was all about to change! 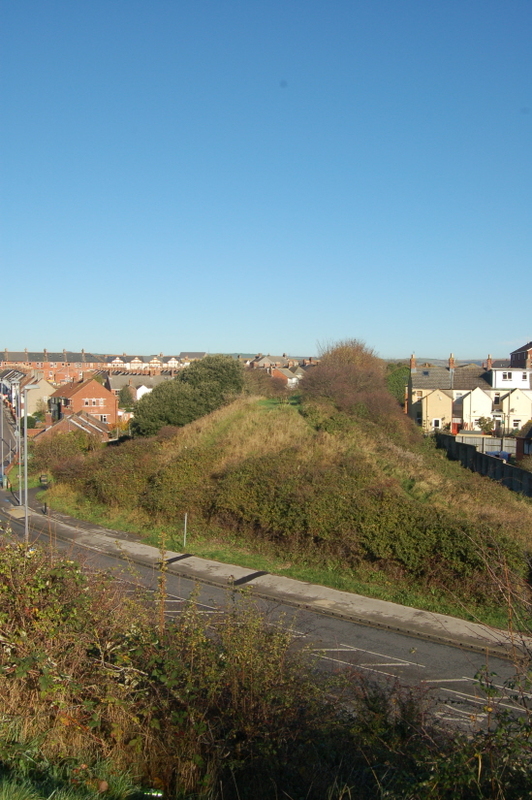 Hidden away between two brand new sets of apartment buildings is the former trackbed of the Portland Railway. Built in 1826 and known as Merchants Incline, this was used solely to transport stone. 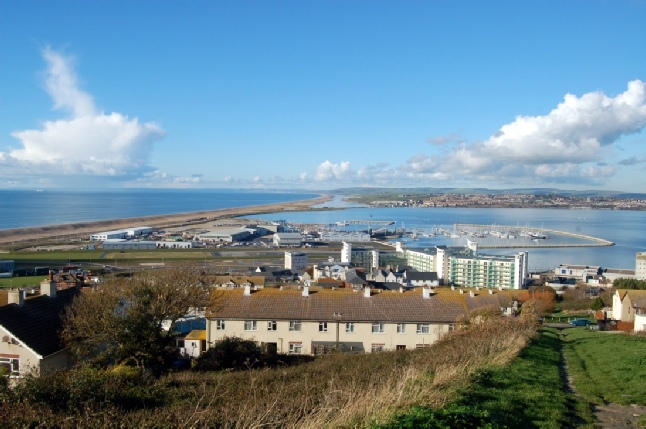 Reaching the top (having stopped for a quick drink halfway up), allowed some totally spectacular views of Portland Harbour, Chesil Beach and the surrounding parts of Dorset. Merchants Incline (far right of picture) climbs up from the harbour side towards The Verne. From here we followed the track bed past some houses at Tillycombe. This section is relatively level and was worked by teams of horses. The next 'point of interest' was Yates's Incline, and whilst not as tall as the first one we had encountered, was equally as steep. Three redundant stone arches tower above the incline, which carried a roadway up the hillside in a zigzag style, and therefore eliminating the fierce gradient taken by the railway. Between Merchants Incline and Yatess Incline is a brief level section. A narrow gauge tunnel still exists along this part of the walk. 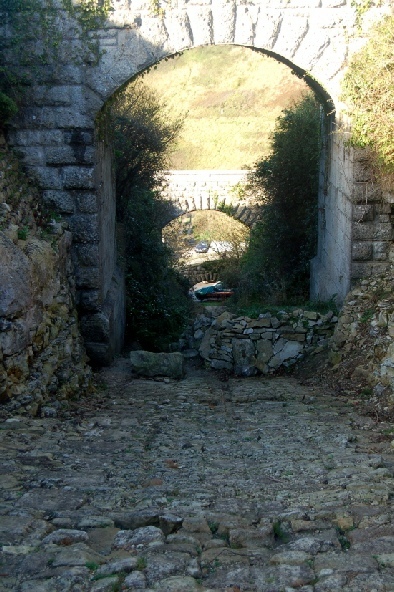 The three arched bridges that carry the zigzag roadway remain today. The double track section of railway is clearly visible at the top of Yatess Incline among the cobbles. At the top, we found ourselves staring down into a large hole. The quarry itself appears to be still in use, although all the stone is now removed by road, rather than by railway. Skirting around the edge, we found ourselves alongside the eastern edge of Portland and high above the sea. The former trackbed can be followed along the coastline by taking a steep slope and some steps down from where we were. However, we opted to continue along the cliff-tops which gave awe inspiring views out to sea, with the sun glinting off the calm water around the shores. From this level, we also had good views of the old railway formation, and could clearly see it's winding course below us. The route description we had been following (as featured on BBC TVs Railway Walks with Julia Bradbury) mentioned a herd of feral goats along this section, which had been introduced to help control scrub. We did not see any of these though! The final part of the journey takes you via Church Ope Cove, past the remains of Rufus Castle before finally turning inland to the former Easton station itself. Nothing remains of the station today, with the area it once stood upon having been totally built over. 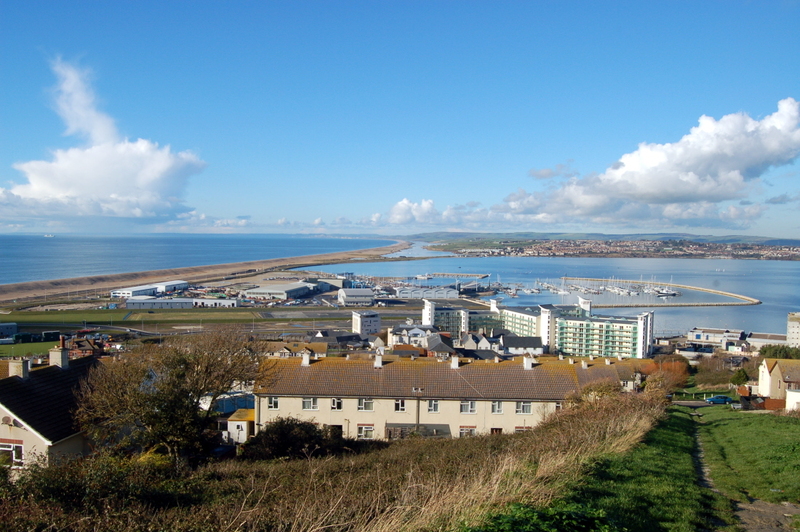 From here it is possible to complete a circular walk back to Weymouth by taking the winding roads down through Fortuneswell, then back across Chesil Beach, before retracing along the Rodwell Trail again. However, after taking liquid refreshment in Easton, we opted to use the regular bus service, which links The Isle of Portland and Weymouth. Our route from Weymouth to Easton was measured at approximately 8miles, but as mentioned at the start, a much shorter, yet just as fascinating, walk can also be enjoyed. *(As quoted on the SEG Website). 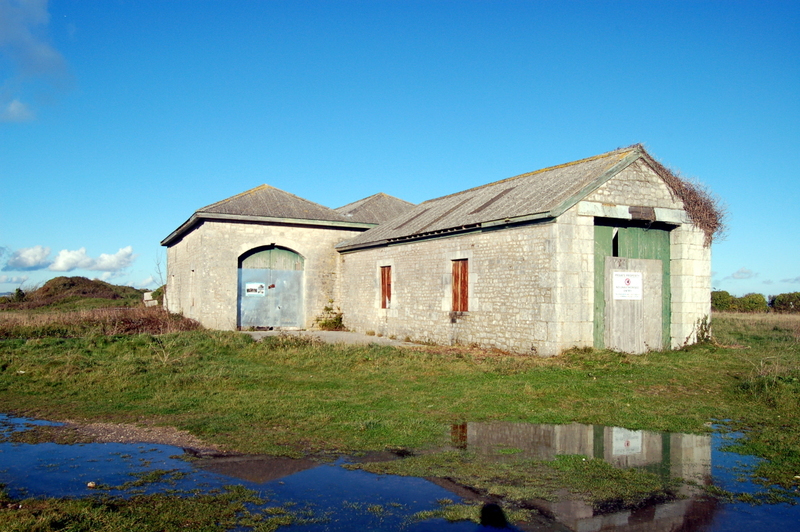 One of the former Engine Sheds still stands today and is being restored by the Portland Gas Trust.